Last week I posted a roasted beet salad recipe, something I was trying out for a dinner party I was leading. While I really liked that salad, I thought it might be too “beety” for people who weren’t really sure if they liked beets or not. Using many of the same ingredients, I managed to make a completely different salad, which was even better! I had a pretty good idea of what I wanted to make, but I still searched the internet for a little direction. I’m always weary of salad with fruit in it, but if it’s paired with a tart vinaigrette, I’m usually sold. It’s the salad with fruit and a sweet dressing that just doesn’t work for my taste buds. 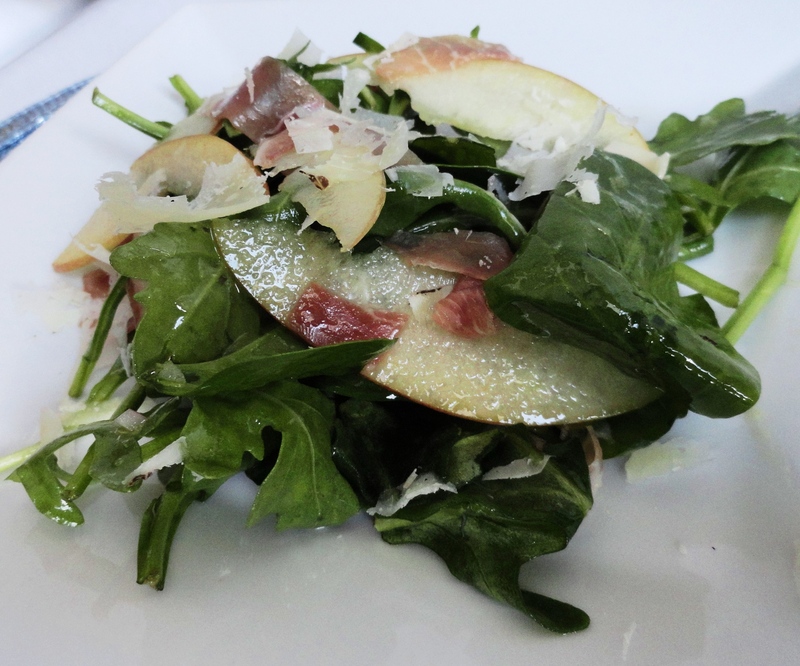 This salad pairs the sweetness of apples, with the saltiness of the Serrano ham and Manchego cheese, evened out with the spicy arugula and cider vinaigrette. I had leftover salad ingredients and was going out of town for the evening. My hubs was having a boys night with his bestie, and smoking some pork. I asked what else they were having with the pork, to which he responded, ” I don’t know, potatoes?” Classic. I put together the salad for them to have alongside their meat and potatoes, thinking they’d maybe have a little bit. Much to my surprise, they ate it all! Not only is this a great salad, but a salad men will eat when their wives aren’t even around! 1. Make the vinaigrette by whisking together vinegar, oil, syrup, Dijon and shallots in a small bowl. Season to taste with salt and freshly ground pepper. Set aside. 2. Place arugula in serving bowl. Whisk the vinaigrette again until well combined, then and to the salad, little by little, until greens are well dressed. You may have a little left over. 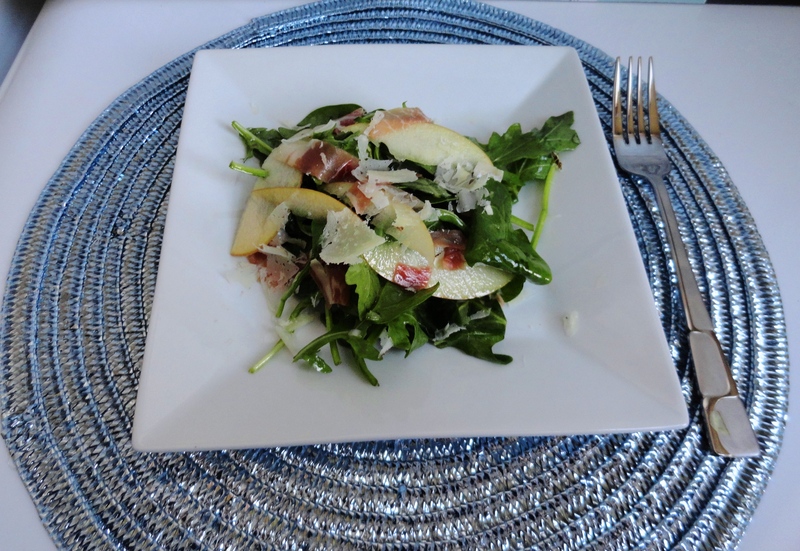 Right before serving, cut apple into thin slices and toss into salad along with Manchego and Serrano ham. Taste and adjust seasoning, then serve immediately. Do you ever get your hopes up for some kind of leftovers, only to find out your sig other (or kids) have finished it off without your knowledge? More on this in a minute. Stuffing is my favorite part of Thanksgiving dinner. 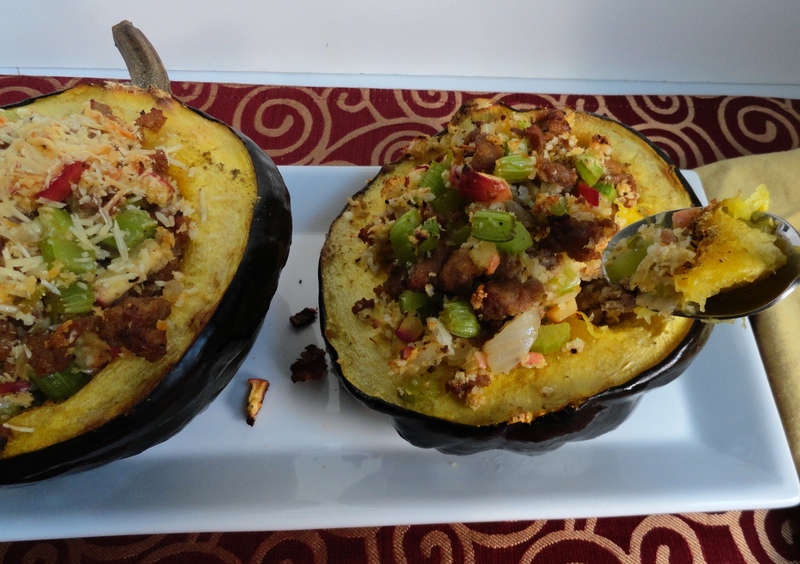 I generally prefer a vegetable stuffing, but I don’t mind stepping outside the box a little and adding a little sausage. 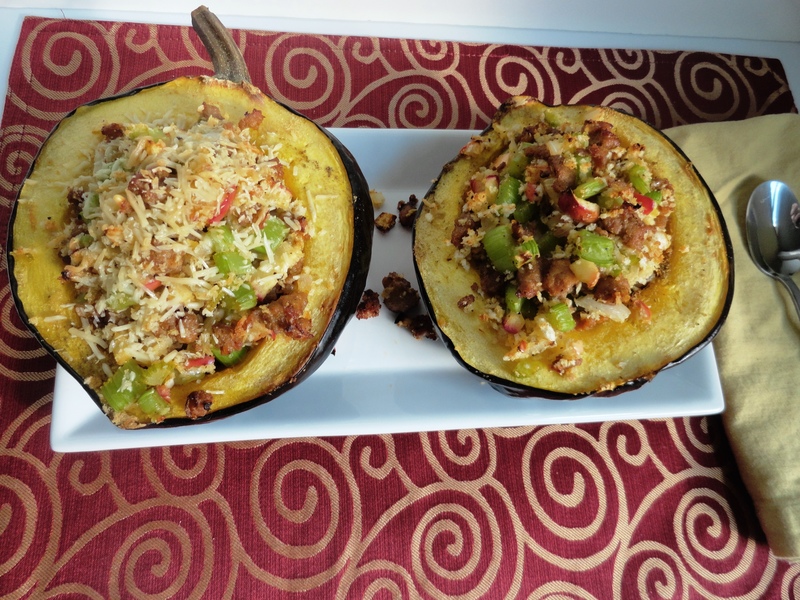 It’s Nate’s favorite…just ask Momma Marsha 😉 Unfortunately (and fortunately for my waistline) the only time of year that I eat stuffing is on (or near) Thanksgiving – and plus leftovers, if there are any! 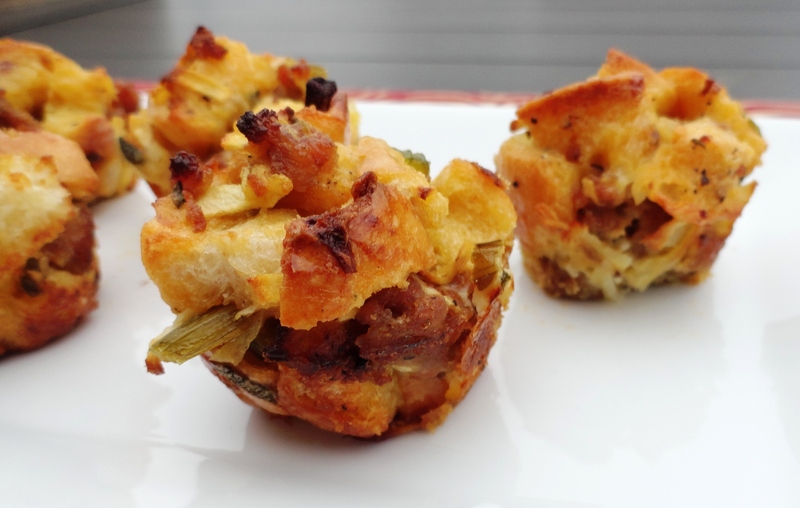 I came across this stuffing appetizer recipe in Food and Wine and had to try it. 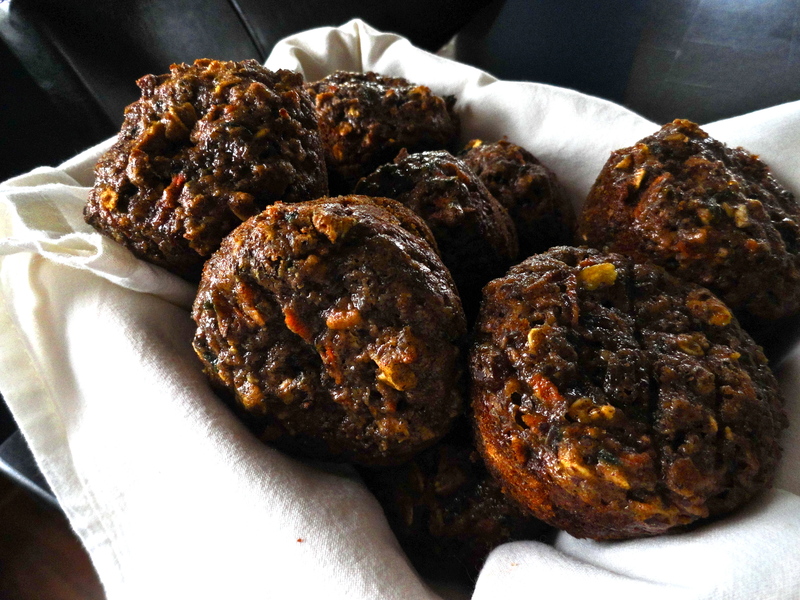 It’s basically stuffing in a muffin, hence “stuffin’ muffins”! Lame, I know. I made these for my girlfriend and myself on Halloween to snack on before we enjoyed our spaghetti squash soup with mushrooms. 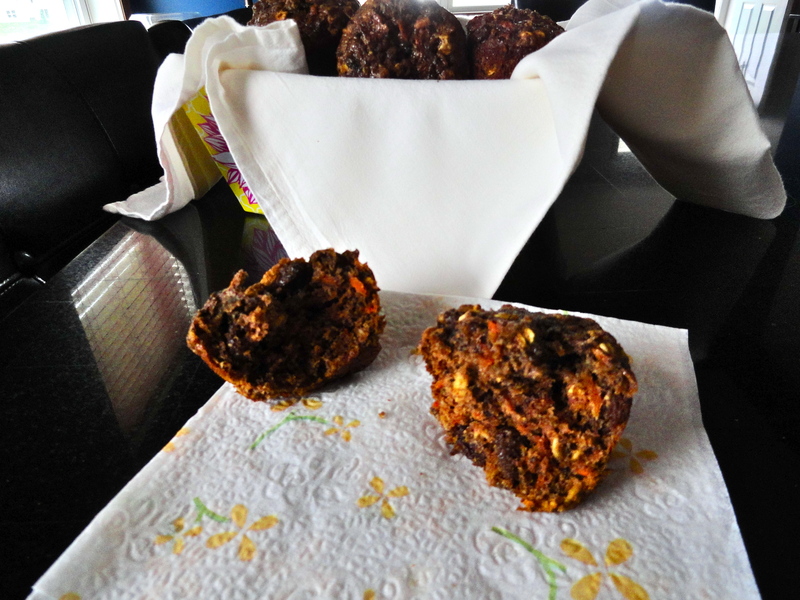 I loved them, and lucky for me, they didn’t all come out of the muffin pan in one piece. Seeing as though I couldn’t possible serve non whole muffins, I got to have a small snack before she got there 😛 Between the two of us, we ate about 6 of these suckers, meaning there were ample amounts of leftovers. I ate two. Nate polished the rest of them off as a lunch over the weekend 😦 I was sorely disappointed as I counted on one or two on Sunday night, only to have my hopes and dreams dashed when he told me there were no more left. 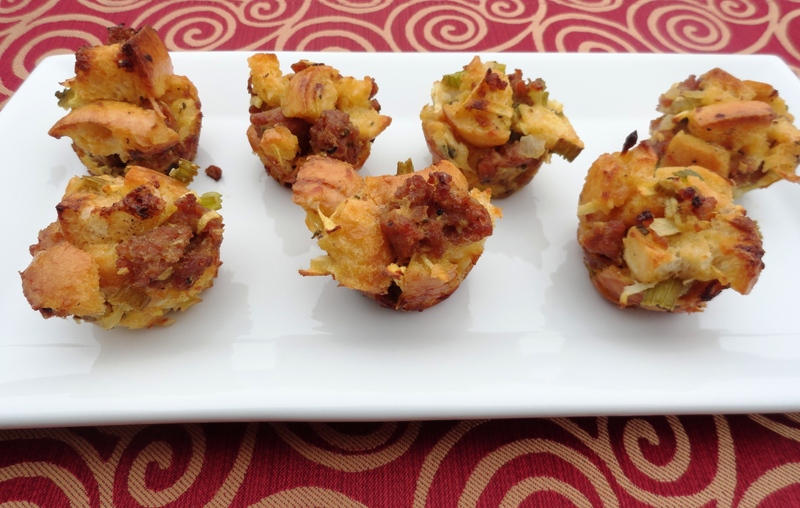 Long story short (too late), I loved these stuffing bites. I thought the hot turkey sausage was a perfect complement to the sweet-tart apple. Certainly any kind of sausage would work, pork, turkey, chicken – sweet or spicy. 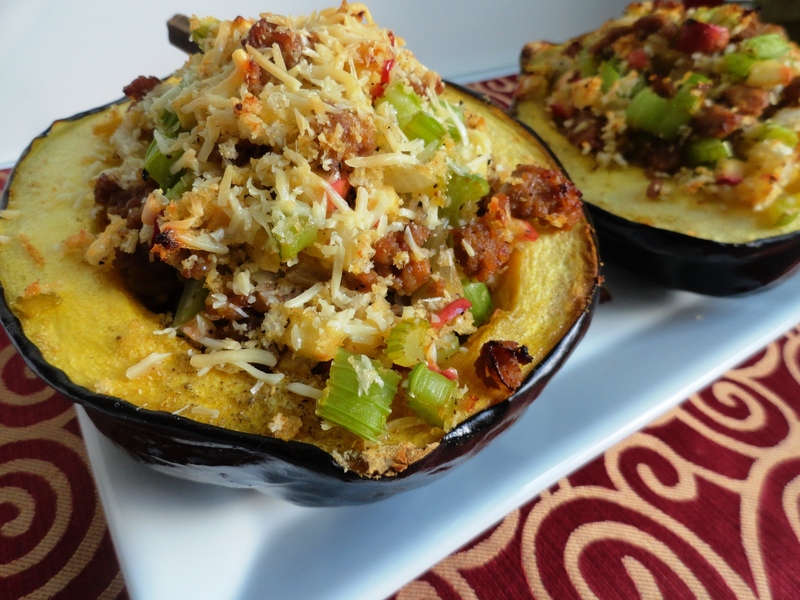 These would be an excellent appetizer at any party over the holidays. Everyone loves stuffing!! 1. Preheat oven to 350 degrees. 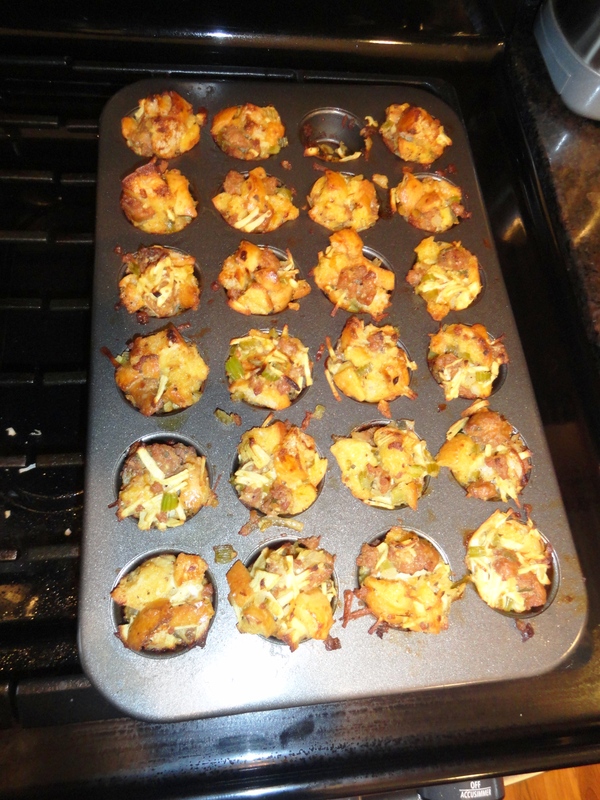 Grease mini-muffin pan with cooking spray. 2. On a baking sheet, toss the bread with 2 tbsp of olive oil; season with salt and pepper. Bake for about 10 minutes, until bread is toasted. Transfer to a bowl and set aside. 3. In a large skillet, melt the butter in the remaining 2 tbsp of oil. Add onions and celery and cook over moderately high heat, until golden, about 5 minutes, stirring occasionally. Add sausage, garlic and sage, stirring and breaking up the meat, until no pink remains, about 5 minutes. Remove from heat. Add sausage mixture, apple, eggs and broth to croutons and mix until all ingredients are evenly distributed; season with salt and pepper. Let stand for 5 minutes. 4. 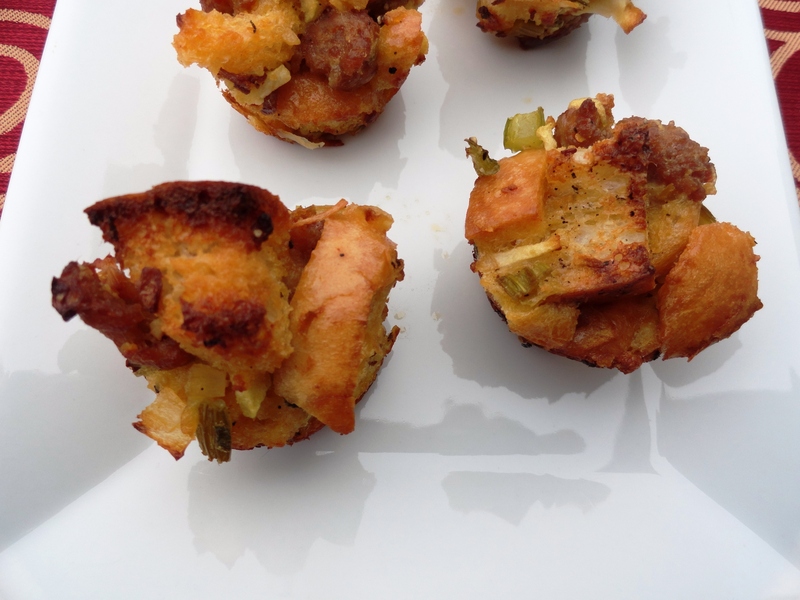 Pack the stuffing into the muffin cups and bake for 20 to 25 minutes, until golden and slightly crisp on the top. Set pan on wire rack and let cool for 5 minutes. 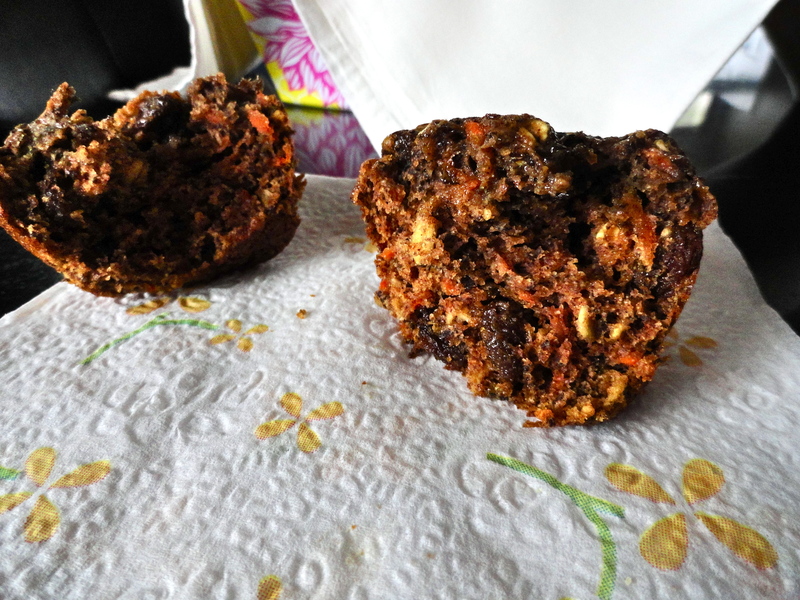 Loosen the muffins with a sharp paring knife and left them out. Serve warm. It’s apple season! I feel like I am learning about new apple varieties every fall. Apples I’ve never heard of before: Sweetango, Lady Slipper, Jazz. There are over 7,500 different kind of apples out there; I doubt I’ll even try .5% of them. I’m very particular about the type of apple I will eat raw, but baking and cooking with apples is a different story. I’m pretty versatile when it comes to using apples in recipes, but apparently, there are some that are really good for baking, and some that are the worst. According to Eating Well, McIntosh and Granny Smith are the best for baking. A combination of the two makes the “perfect” apple pie. Red Delicious on the other hand are the worst for baking. They say it’s the worst for eating too, so what are they good for? To finish up, Honeycrip is the best apple for eating. I do not agree – which is why I find it hard to believe that one apple can be better for eating or baking over another. Isn’t just personal preference? Regardless of what is “best”, I tend to use what I have on hand or what is on sale for baking. 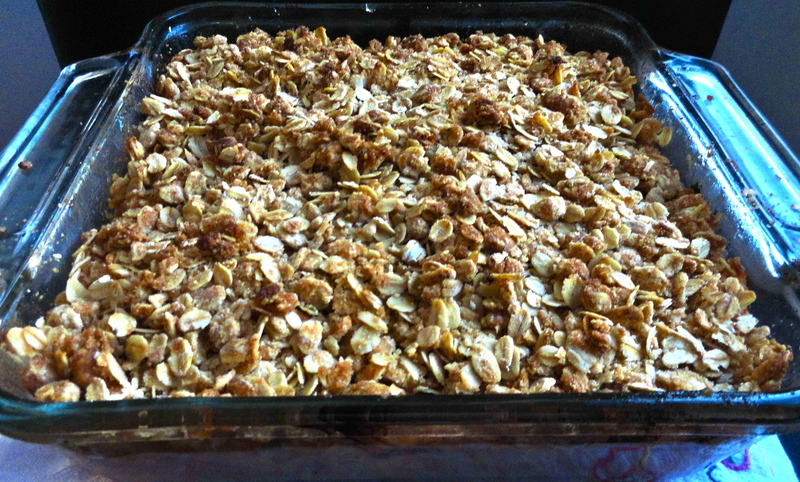 For Hezzi-D’s apple crisp I used Haralson apples, and I thought they were perfect! 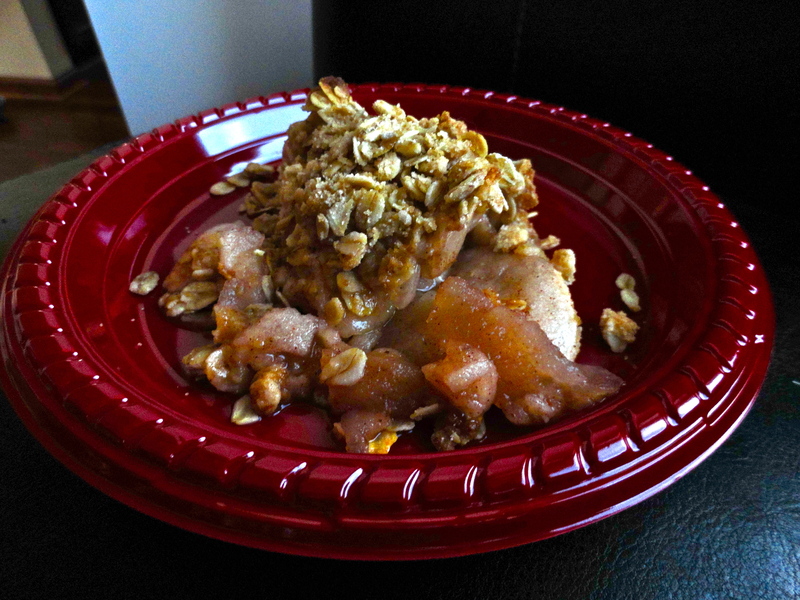 Even my neighbor, who proclaimed he doesn’t like apple crisp, said that this was awesome. I’m really getting the hang of this baking thing! I doubled the topping because after making a single portion, I didn’t think it was enough and I’m pretty sure the “crisp” is the best part of the apple crisp – at least in my opinion. Serve this warm with some vanilla ice cream and you’ll be in heaven. Promise. 1. Preheat oven to 375 degrees. 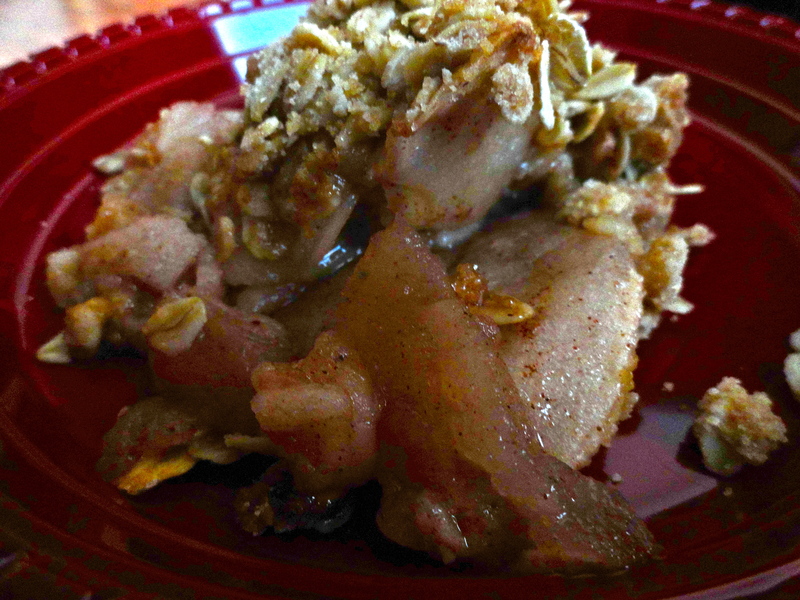 In a large bowl, combine apples, sugar, cinnamon and nutmeg. In a small bowl, combine lemon juice and water, then pour over apple mixture. Stir to ensure all apples are coated. Transfer to a greased 8×8 baking dish. 2. In a small bowl, combine oats, flour, brown sugar, baking powder and melted butter. Using the back of a spoon, incorporate well until mixture is crumbly. Sprinkle over the top of the apples. 3. Bake for 35-40 minutes, until apple filling is bubbly and top is golden brown and crisp. Remove from oven and let cool for 5 minutes before serving.